In January 2016 I left behind my career in the television industry to pursue a life as a full time strala yoga guide! It was a terrifying leap of faith but a necessary one that took me from a life of tension, pressure and bouts of depression to one where health and wellness is priority. 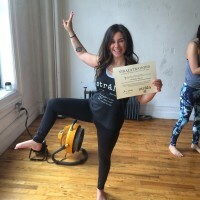 Strala yoga has helped me to accept myself as a person living with mental illness and my practice has become a key tool in keeping me stable and happy on a daily basis. I am now the owner of a beautiful little yoga studio in Montreal where I guide multiple strala yoga classes and I have made it my mission to offer a space where mental health is the priority, all people are welcome and uniqueness is celebrated! Check out my blog on mental health and yoga!